1. Use a mixture of tomato juice and lemon juice in equal quantity (1 tablespoon) and apply this mixture on the face. Leave it for 10 minutes and wash off. You may also add a teaspoon of honey to it. 2. Eat Vitamin A rich foods like papaya, peaches, carrot, green leafy vegetables etc. They increase resistance and support skin growth. 4.Add 1 tablespoon each of orange juice and lemon juice to a cup of yoghurt and mix well. Apply the paste as a mask on your face and leave it on for 15 minutes. Clean it with a wet tissue thereafter and watch your complexion glow. 5.Using sunblock. Excessive sun exposure can cause black spots on the face, wrinkles and skin dryness. 6.Grate Carrot and mix it with yogurt. Apply the mixture on face for 15 minutes daily for atleast 15 days to see the best results. 8.When you increase your blood circulation, you improve the texture of your skin. A brisk walk or even a brief run also helps flush out nasty toxins. Exercise At least 1 hour daily. Feel better, look better. Cardio workouts are best for getting a natural skin glow. Exercise regularly for radiant skin. 9.Lemon: I don’t feel it need an introduction about the benefits of lemon juice for your skin. It is well known commonly used skin cleaning, skin clearing and skin toning agent. 10. if you stay happy and smile often, not only will you look younger but also more attractive, beautiful and radiant. 11. Avoid hot dryers and in case you use hairsprays, glitter and other hair products make sure to wash off all the chemicals from your hair completely. 12. Catch-up on some shut-eye. Sleep boosts the immune system and is the time your skin gets to regenerate. 13. Soak a towel in ice cold water and press it to your face; this constricts blood vessels and there’s less fluid accumulation. 15. you tend to get puffy eyes. Splashing cold water in the eyes and the use of eye pads with cucumber, potato and green tea bags will help reduce puffiness. Chocolate lovers no longer have to fear the flab as eating more can help you keep slim, new research claims. The effect is modest but greater than can be explained by chance, say the US researchers who took account of influencing factors such as overall fat consumption and exercise. BMI relates height and weight and is the standard measurement used to assess levels of obesity. The good news about chocolate emerged after scientists screened a group of 972 men and women with an average age of 57 for a study of statins - cholesterol-lowering drugs. Among other diet and lifestyle questions, participants were asked: "How many times a week do you consume chocolate?" Chocolate is known to contain plant chemicals called polyphenols that combat heart disease and may influence metabolism. The researchers suspected they might, to some extent at least, off-set the unwelcome effects of high saturated fat levels in chocolate bars and sweets. No account was taken of different types of chocolate, some of which contain more healthy elements than others. 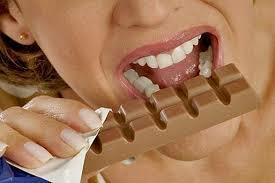 The results showed that chocolate was not only "calorie neutral" but actually appeared to make people slimmer. Participants who ate chocolate on more days of the week than average were statistically likely to have a lower BMI than those who did not. This was despite the fact that people who ate more chocolate did not consume fewer calories overall, or take more exercise. Study leader Dr Beatrice Golomb, from the University of California at San Diego, said: "Our findings appear to add to a body of information suggesting that the composition of calories, not just the number of them, matters for determining their ultimate impact on weight. "In the case of chocolate, this is good news - both for those who have a regular chocolate habit, and those who may wish to start one." - Drink around 8 to 10 glasses of water everyday. If you can drink more as it will keep you hydrated and flush out the toxins from the body. And it is very important to drink water to have a glowing skin. - Use a natural bristle brush, lightly apply colour to the areas of the face where the sun would naturally hit: forehead, cheeks and the bridge of the nose. If needed, apply a light dusting on your neck and chest for even all-over colour. - "By and large what makes a bride is her natural glow. Skin should be able to breathe. Fair girls can use peach pink tones while wheatish should go for earthy tones. The way a bride looks in photographs is also important so a matte finish is advised. A powdered base foundation gives a subdued look to the bride. So keep the gloss just to the lips and the eyes." - Make time for yourself and indulge in the treatments from two months or at least six weeks before the wedding day. - If your skin is oily, avoid applying moisturizer before application of foundation. - Wedding Make-Up Tip: Pimples and Acne If you do Have a Breakout,do not pick,do not do anything that can irritate or ridden or enlarge the problem. Use pure Aloe Vera to treat any bumps or breakouts. It is a wonderful healer. - Last but not the least you need to relax and shun off all the stress. I know it’s difficult to practice but stress can spoil your skin making it look worse. - A big, bright, joyous smile: You won't be able to turn yours off on your wedding day. Here's our method for getting your pucker prepared. - Take vitamin C tablets to get rid of the redness in your skin. Furthermore, drink natural juices, especially pomegranate juice regularly. Pomegranate juice is probably the best juice you can take before your wedding to give the right glow to it on your wedding day. - Red-Carpet Beauty Looks to Steal for Your Wedding. Allu Arjun married Sneha Reddy on 6 March 2011. Anne Hathaway married Adam Shulman at a stunning wedding in California.